38. Inwendige van een Theefabriek. Harvested tea leaves were delivered to factories for processing al the end of each day. In each factory, tea was spread on the floor in one-centimeter-thick layers overnight to reduce moisture. Next the leaves were graded, then rolled and crushed either manually or by machine to release their flavor. After that, the leaves were spread in layers to stimulate fermentation into its familiar dark, fragrant form. In 1898, lhe colony exported 4.5 million kilograms of tea. By 1911, tea exports had burgeoned to 17.5 million kilograms. 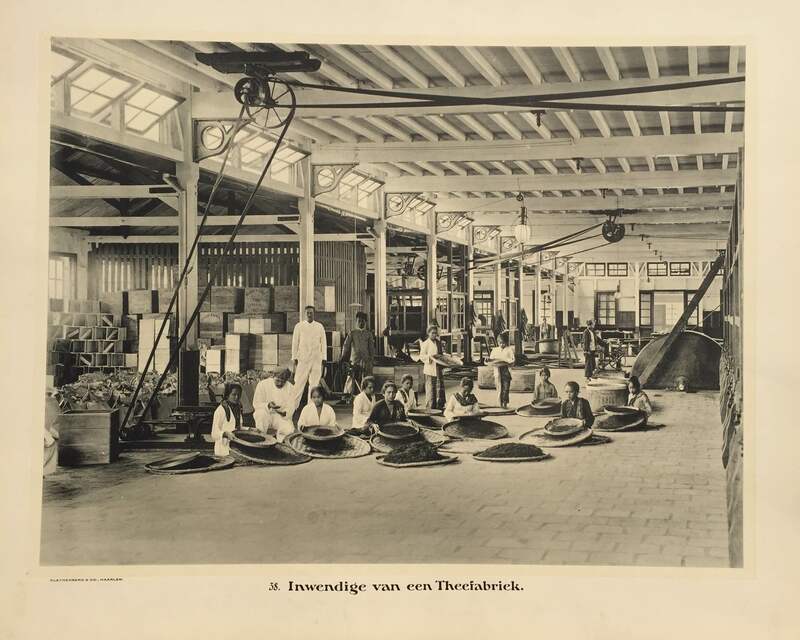 Antique school board showing the Inside of a Tea Factory. Taken c.1895 and published between 1912 and 1914 in Holland.